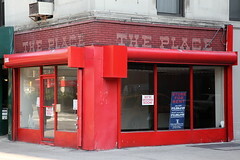 The bright red facade belonged to a travel company that has decamped down Broadway. Removal of that company's signage revealed blocky letters, painted on brick, in an old-timey typeface, and a name that has the ring of a restaurant or a watering hole. More I don't know; do you?